MBSE HSLC/HSSLC Routine 2019: Mizoram Board of School Education (MBSE) has released the HSLC, HSSLC Exam 2019 Routine for the forthcoming board examinations. While class 10 examination will begin on 28th February, higher secondary school leaving certificate exam (class 12) will begin on 5th March, 2019. Mizoram Board of Secondary Education is going to conduct the HSLC/HSSLC Examinations in February/March months. Students presently gaining education from Mizoram Board can download Mizoram HSLC Routine and Mizoram HSSLC Routine 2019 in December/January months at indiaresults.com or MBSE Official website. Students can get ready to check the Mizoram board time tables 2019 for class 10th and class 12th. Follow the MBSE Official website, mbse.nic.in for regular updates regarding the examination dates, timings, latest notifications and other information. Check the following article for more details. The Mizoram Board of Secondary Education (MBSE) is the state level education board that offers the secondary and higher secondary education for students. Annually a huge number of 10th and 12th classes students will take place in the examinations. The Higher Secondary Leaving Certificate (HSLC) and Higher Secondary School Leaving Certificate (HSSLC) examinations will be conducted for the understudies in March/April Months annually and the results of Mizoram HSLC /HSSLC will be announced in the month of May. The board is also having the successful pass percentage for class 10th and 12th. Students getting education under MBSE can check the MBSE Official website, mbse.edu.in on regular basis to check the information regarding the examination dates. Last Year the Mizoram Board has conducted the HSLC examinations from 28th February to 15th March and HSSLC Examinations from 5th March to 29th March. The MBSE HSLC Date sheet was released in December month and MBSE HSSLC Date sheet was also released with a few days difference. 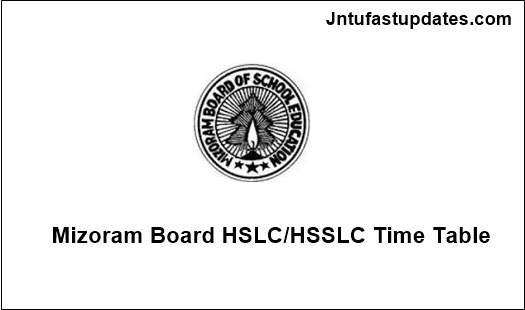 As per the last year schedule, the MBSE HSLC and HSSLC Time Table 2019 is likely to release approximately same this year also. Hence students can check the MBSE Official website regularly for latest updates. Candidates can also follow the Mizoram local news papers and TV Channels to know the information regarding the examination dates. It is hereby notified for the information of all concerned that the High School Leaving Certificate Examination, 2019 under the Mizoram Board of School Education shall be held as per the programme given below: Class 10 examination will begin on 28th February, 2019. Unexpected holiday(s) declared by any authority other than the Chairman, Mizoram Board of School Education, after publication of the Examination programme, will not prevent conduct of the examination(s) scheduled for the day(s) concerned. On the homepage, MBSE HSLC & HSSLC Exam Routine 2019 Link appears; Click on the Link.